Last Friday night I was amazed/stunned/mesmerized by the Western Athletic Conference showdown in Reno between Boise State and Nevada. – (:39 seconds in): With Boise ahead comfortably 24-7 on the third quarter, Nevada QB Colin Kaepernick rolled out of the pocket, pumped, took off, made a defender miss, and then leapt over the pylon with the ball in his hand to complete the 17 yard TD run. It was an amazing play that gave Nevada a huge burst of momentum and cut the deficit to 10. I thought it was Vick-esque and couldn’t stop saying “WOW!”. 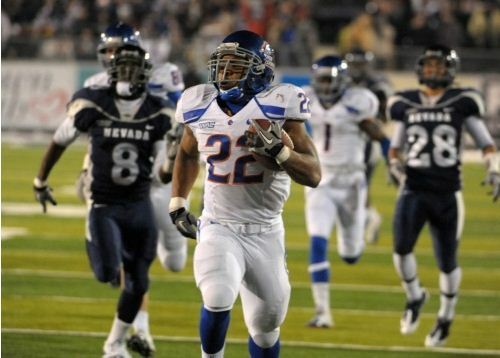 – (1:10 in): After a Nevada field goal to tie it up, Boise got the ball with a little over five minutes to go. They had faced adversity in their opener at FedEx Field against Virginia Tech yet still pulled out a W. I was thinking “Could they do it again? Could they do it here?” We didn’t have to wait long for an answer. On the first play of the drive, Boise QB Kellen Moore found Doug Martin on a screen pass underneath. Martin then got some stellar blocks down field, weaved through them, juked one defender, shed off another, and thanks to some poor pursuit angles by the Nevada safeties, went the rest of the way untouched for a 79 yard TD. Talk about responding! It looked like Boise would prevail again. But Nevada had their own responding to do. They engineered a 14 play, 79 yard TD drive which tied the game up and ate up almost all of the clock. This leads to jaw dropping play #4. – (1:41 in): Boise got one final chance with just nine seconds to play and the ball on their own 38. Moore heaved the ball deep down the field and Titus Young made a spectacular diving catch with just one second left. This was straight out of arena football, or an EA Sports video game! How could Nevada have allowed themselves to get beat deep? Of course the end of the game was quite memorable, with Boise kicker Kyle Brotzman missing a field goal at the end of regulation and in overtime…both of which were under 30 yards. Just an incredible game, it was as much fun watching a college football game as I can remember. It made it that much more memorable that the conclusion occurred at 1:52 a.m. and that it shook up the BCS standings (Boise entered the game ranked 4th).